There’s no one right way to brew a cup of tea, and every tea we carry can be enjoyed several ways. But if you’re looking for a place to start, here are some guidelines for how to get the most of any tea. Relax! The easiest way to botch a brew is to stress out about making it. Pay attention to what you’re doing, but don’t take it too seriously. Good tea takes time. Tea made in a rush tastes rushed. Give yourself time to brew with care and appreciate the fruits of your labor. Use good water. At T Shop, we use a reverse-osmosis water filter to turn ordinary tap into a rich, sweet water for brewing. You don’t need anything that specialized, but start with water that tastes good to you, be it tap, filtered, or bottled. And keep it hot. With the exception of some delicate green and white teas, we recommend using boiling water (212°F/100°C) for all brewing. The hotter the water, the more flavor, aromatics, and body you’ll extract from the tea, and we prefer to brew with hotter water for a shorter duration to get the most out of our leaves. If your tea tastes bitter, or you just want a milder, sweeter cup, you can cool freshly boiled water by pouring it into a separate cup or pitcher before using it to brew. Re-steep your leaves. Quality loose leaf teas can be re-steeped several times before losing their flavor. At a T Shop tasting, we steep a tea five or six times so a guest can experience the full range of tastes a tea can offer. There’s no hard rule about how many times you can re-steep a tea; continue until you feel the tea’s given everything it can offer. 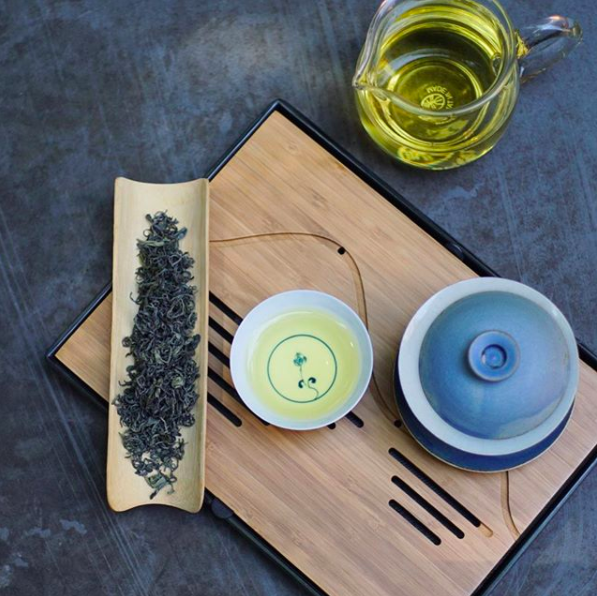 At T Shop, we prepare teas in a lidded cup called a gaiwan or small pot made of yixing clay. Both vessels belong to a Chinese tea tradition called gong fu cha, which roughly translates as “make tea with skill.” By repeatedly brewing a relatively large amount of leaves with a relatively small amount of water, a tea maker can draw incredible depth out of loose leaf tea that you won’t find with other methods. You can brew any tea this way, but it’s particularly suited to the oolong teas and pu-erh teas that we carry. To start, pre-heat your gaiwan, pitcher, and cups with freshly boiled water. Dump the water in a waste bowl or down the drain, then add enough tea to cover the bottom of the gaiwan. We then like to “rinse” the tea with a five-second brew to open up the leaves, but this step is optional. For your brew, fill the gaiwan about three quarters of the way; the water line should hit right where the lid fits on top. Steep the tea for 15 to 30 seconds depending on your desired strength. To pour from a gaiwan, tilt the lid askew so part of it dips below the waterline; it will act as the strainer as you pour the tea. Then, grasp the rim of the gaiwan with your thumb and middle finger, and rest your index finger over the knob of the lid to keep it in place. Carefully lift the gaiwan and tilt it over the sharing pitcher to decant the tea, then pour into individual cups. Repeat for as many steepings as you like. For a larger teapot use one or two tablespoons of loose leaf tea depending on your desired strength. Re-steep once or twice, but don’t expect to get as many brews out of this method. Loose leaf teas will expand two to four times in size as they rehydrate, so use a filter that gives your tea plenty of room to expand. You can also brew tea directly in your mug. Add a teaspoon of leaves to the mug, cover with hot water, and wait a few minutes until the tea leaves settle to the bottom. Use your lips as a filter to enjoy the tea simply and directly. Note that this method works best with whole-leaf teas. We also carry bagged Alishan oolong tea for high quality easy drinking. The easiest way to make great iced tea is to cold-brew. Use one tablespoon of tea for every quart/liter of cold water, cover, and refrigerate overnight.